The year 1843 saw several distinguished visitors at Haddon. In September Sir Robert Peel, then Prime Minister, visited the Duke of Rutland. On 2nd December Queen Victoria and Prince Albert spent two hours looking round the house and gardens. They were staying a few miles away with the Duke of Devonshire at Chatsworth House and their party were driven to Haddon in three open carriages. Captain Underwood, the Duke of Rutland's Steward, met the Royal party and showed them round. It was Victoria's second visit as she had been to Haddon a few years earlier with her mother, the Duchess of Kent. A Royal visitor from overseas, the King of Saxony, viewed the property in the following June. He stayed at the Rutland Arms in Bakewell whilst he was in the area. Her Imperial Highness, the Grand Duchess Marie of Russia, came in 1853 and was a guest at Chatsworth. 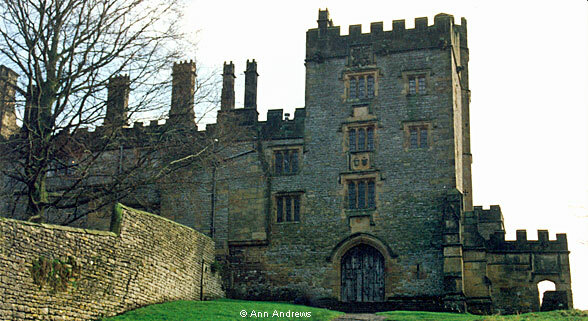 Another foreign Royal, the Emperor of Brazil, toured the fortified mediaeval manor in 1871. 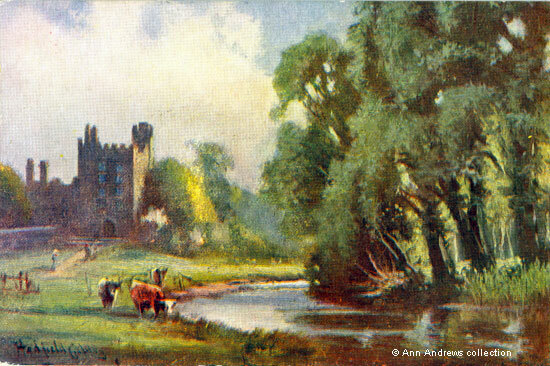 Haddon Hall from River Wye, from a painting by the locally based artist Henry Hadfield Cubley. Cubley has flattened the slope up to the gatehouse. There are cows in the foreground. In 1872 the Prince and Princess of Wales, later Edward VII and his wife Queen Alexandra, were at Chatsworth. When they visited Haddon their carriage was met by the Duke of Rutland and he escorted the Princess; the Duke of Devonshire escorted the Prince. They visited the older parts of the building before ascending the staircase to examine the upper rooms. The Royal party lunched at Haddon, sitting on "some fine old chairs that are considered part of the gems of Haddon". Their daughter-in-law, Queen Mary, followed in their footsteps just before the First World War. Queen Mary was to pay another visit to Haddon in 1933, this time accompanied by her husband George V.
Another idyllic rural scene. There are more cows, this time in the River Wye, in this 1930s view of Haddon. The chapel can be seen in the southern-most corner of the building,closest to the camera. Some years before the mass trespass of Kinder Scout there were public protests over the closure of some of Haddon's footpaths. In February 1924 it was reported that people throughout the Peak district had, for several months, been extremely indignant about the closure of a number of woodland and other footpaths said to have "been public from time immemorial". Three hundred local residents and workmen with pickaxes broke down several stone walls that had been erected near Haddon during the previous September. They also opened wooden gates with spiked tops and uprooted warning notice boards but encountered no opposition. In March 1925 Mr. J. W. Black, M.P. for Harborough, gave notice that Commons would ask the Minister of Agriculture whether he aware that public feeling has been aroused regarding the footpaths being barricaded. Lord Granby then took Bakewell UDC and the RDC to Court. When the case came up in the High Court, the Earl said he had no quarrel with the Council, nor any objection to local people. He explained that he wanted to use Haddon as his home in the future. His real issue was with non-locals, the tourist parties travelling by charabanc, who were straying from designated pathways. Settlement was reached, with certain paths being closed and others declared as highways and open to the public. to this entrance. On the right is the porch to the Great Hall. 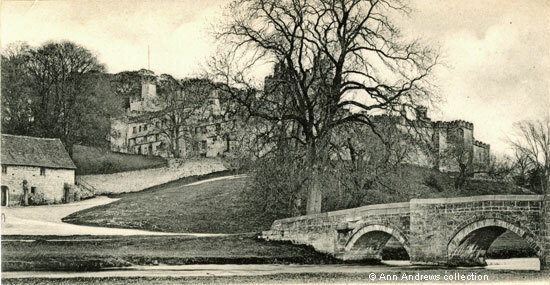 At the end of the same year (1925) Haddon was closed to the general public after being open for "innumerable years". The Duke of Rutland wished to take up residence in 1927, so extensive alterations were needed to make the building habitable, including a water supply scheme. The three bay windows are those of the Long Gallery. 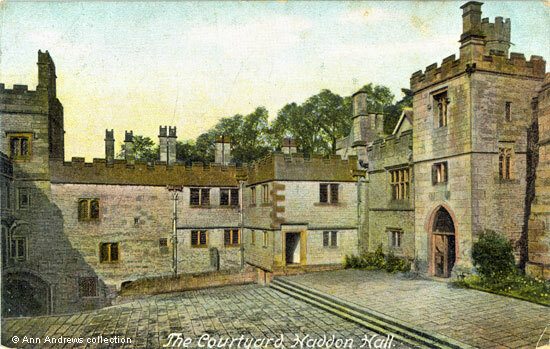 Haddon was occupied until the outbreak of war in 1939, but was then used by the Public Record Office as storage. In mid-1946 the property was derequisitioned. It had been closed the public for more than 20 years, but was to re-open from July 29 on all days except Sundays. These days it is also open on Sundays, though visitors days and times should be checked on Haddon Hall's web site as opening varies throughout the year. Haddon Hall, The Garden Front. The gardens descend in a series of great terraces (see map on the next page), with Dorothy Vernon's walk at the top. The two images immediately above provide us with a glimpse of the Upper Garden. Simon Jenkins, in his book on "England's Thousand Best Houses", awards Haddon five stars, indicating he believes it to be one of the top twenty properties in the country and one of three with five stars in Derbyshire*. It "is the most perfect English House to survive the Middle Ages". *The other five star properties are, of course, Chatsworth House and Hardwick Hall. 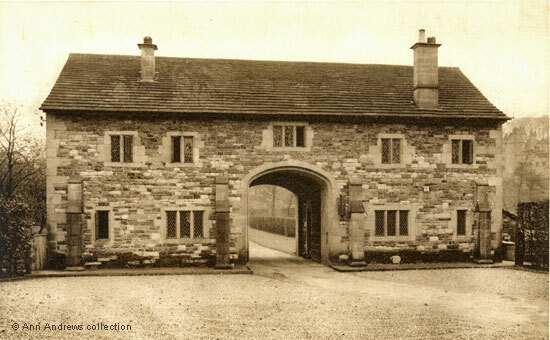 Upper Court Gateway, Haddon, about 1926. The top of the crenellated Eagle Tower, also known as St John's or Peveril's Tower, in the north-east corner of Haddon is reached by a spiral stone staircase of 70 steps from the second courtyard. There are views of the surrounding landscape and also of the buildings below. 1. "Haddon Hall from River Wye". Stengel & Co. Ltd., London E. C. 39 Redcross Street No.16152. Printed at Works, Dredsden. Undivided back. Not posted. 2. "Haddon Hall, Gate House"	Photochrom Co Ltd, Tunbridge Wells, Kent, No. V.1009. Not posted [another posted in 1949]. 3. "Haddon Hall". Ralph Tuck & Sons "Oilette" [Regd,] Postcard 1487. Art Publishers to their Majesties the King and Queen. Posted on 9 Jul 1904 at Matlock. Sent to a Miss D Wall of Darley from G. Cardin. Message about a book. 4. 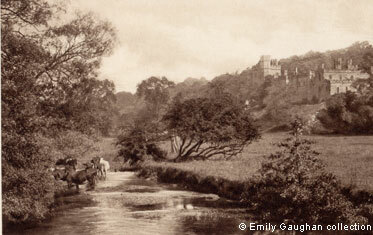 "Haddon Hall from River Wye", Photocrom Co Ltd, Graphic Studios, Tunbridge Wells, Kent, No.33249 (there is a coloured version, with the letter A before the number). This series was published in the 1930s - another card was posted in 1934. This image © Emily Gaughan. 5. Photograph of the north entrance © Ann Andrews, January 2001. 6. "The Courtyard, Haddon Hall". Artistic Series, A.P. Co., 9 Bury Court, St. Mary Axe, London, E.C No.127. Not posted. 7. 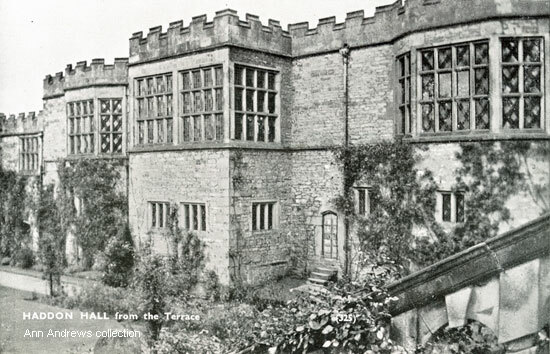 "Haddon Hall from the Terrace". Published in "Derbyshire Beauty Spots, No. 2" (about 1950) (No.325), Photo: Simpson's the Printers, Friar Gate, Derby. Published with the kind permission of Michael Simpson on behalf of the Simpson family. 8. 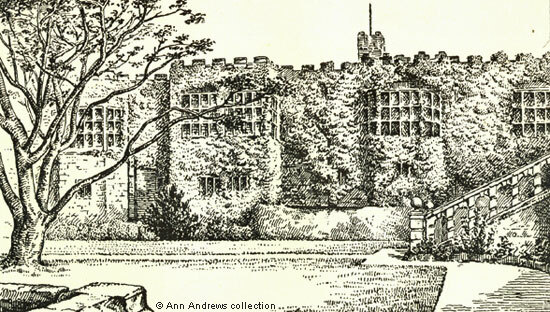 "Haddon Hall, The Garden Front". From a photograph by Mr. S. F. Wood of Duffield and published in Cox (1915) "Derbyshire". 9. 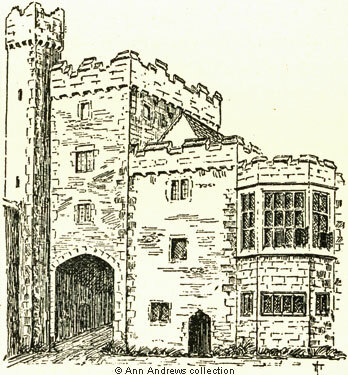 Sketch of "Upper Court Gateway" by T. L. Tudor from "High Peak to Sherwood" (1926). All cards and images, apart from no.4, in the collection of, provided by and © Ann Andrews. "The London Standard", 8 September 1843. Peel had arrived from Drayton Manor in Staffordshire. "The Derby Mercury", 6 December, 1843. In the 1851 census Captain William Underwood, aged 75 and born in London, was living at Castle Hill, Bakewell with his family and servants. He was still the Duke's Agent. "The Derby Mercury", 26 June 1844. "The Morning Post", 10 September 1853. "The Times", Saturday, 21 Dec, 1872. The Prince of Wales at Haddon-Hall. "The Times", Wednesday, 5 Jul, 1933. "The Times", Monday, 25 Feb, 1924. "Derby Daily Telegraph", 19 March 1924. "The Times", Saturday, 22 March, 1924. Chancery Division. The Amenities of Haddon Hall. "The Times", 17 and 29 March, 1924. High Court of Justice. "Derby Daily Telegraph", 30 December 1925. "Derby Daily Telegraph", 15 July 1946. Hall open soon as a public showplace. "The Times", Saturday, 6 June, 1987. Article by Nigel Andrew: "Romance in the stone." The pen and ink sketch is from: Thomas Linthwaite Tudor (1926), "The High Peak to Sherwood, The hills and dales of old Mercia", published London by Robert Scott. The Gentleman's Magazine Library, 1731-1868 (under Bakewell). MI of Sir George Vernon family and mentions the tomb of his daughter who is also commemorated in the church. Derbyshire's Parishes, 1811 includes a short piece about Haddon, under Bakewell.